First question! What's the usual price for a MPC plush? ALSO: is the eBay user givingfun a good seller? Are his plush real or no? Thanks guys! Sales post will be soon... I'm just busy at the moment with clearing out my room and shiz. in other kinda sad news, since we're putting out house up on the market and moving soon, i have to pack away about half of my collection. ;__; can't make the shelves look cluttered for the pictures and house viewings. i'm keeping up all my favourites but still it's disappointing. sigh. I'm questioning this: Is there anyone out there selling a Cryogonal MPC plush at all? I tend to stay within the community when it comes to buying, just because I love buying from fellow collectors, and would rather not buy an entire lots of plush all for one, especially when I don't have sales permission. I don't need other plush taking up my limited room space. I've got a collection post coming tomorrow, since I need to gather my things together again. 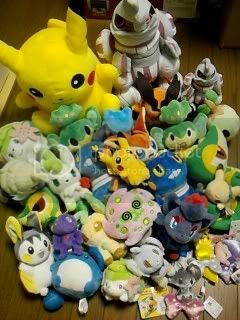 Be prepared for tons of plush, figures, and Zekrom. Oh hell there, community! Just a reminder that my offers on Eevee Play by Play, Zubat Play by Play and Rotom and Vaporeon Pokedolls end tonight at 11:00PM EST! Payment still needed and auctions. I don't like being bad cop, but please make your payment by 5/20 or you will be left negative feedback! theevilpotato has already messaged you, so this is your last warning! Payment spreadsheet is >>here<<, and you can send to kyuubic(@)yahoo.com. Thank you! These auctions are still going on until Tuesday! Many are at their starting bid or very low! I'm pretty sure these are allowed as long as they are with other information, correct? Sales: New stuff and lower prices! 50%+ off + $1 sale! I spent this week putting 600 items at Floaroma Pokemart on sale or further reducing prices - many are now 50+% off, or only $1! Stock is selling out fast! Sales permission was grandfathered. Have you ever had one of those weeks. . . I was granted sales permission by denkimouse on March 10, 2011. I ship from the US and will ship internationally. Shipping for flats starts at $1.00 within the US, $1.50 international. Shipping for larger items starts at $2.50 within the US, $3.50 international. I ship within 1-3 business days. I only accept Paypal. Payment is due within 24 hours of receiving your total or the items will be available to anyone. I am not responsible for items lost in the mail. Please ask for tracking or insurance if you need it! Community feedback is located here. <3 I may trade for items on my wishlist! IMPORTANT!! You must state whether you are definitely purchasing the items or asking for a quote. Asking for a quote does not reserve the items for you! I have a couple more items coming in to sell, but for now I am trying to clean up inventory. Almost everything is under $5! I have way too many bubble mailers so help me clear 'em out haha. If you ordered from me your stuff will be all shipped out as of tomorrow! I sent a few yesterday and today. So here would be a preview of what i bring you today :D Such as a Latios bean and Treeko bean auction, kids, zukans, cards and Hungarian pogs. ACEN GETS! New Gets! Cosplays! Ever wonder why entei is so grumpy? Click the links below for some great amusement! Long time no post, but I'm back and looking for postcards! :3 If anybody has any for sale, I'd love to see! My Pikachu collection has exploded, and I don't have room for normal merch, so I'm going after postcards for the time being. Hi, I'm looking for all kinds of Tangela figures. I am trying to start a new collection with one of my favorite pokemon. Also, does Tangela have any plushes? Any got any customs, love to see pics of him.